At Ohio’s Southern State Community College, the “big man on campus” isn’t a star athlete or a teenage genius—in fact, it isn’t even a human; it’s a robot. 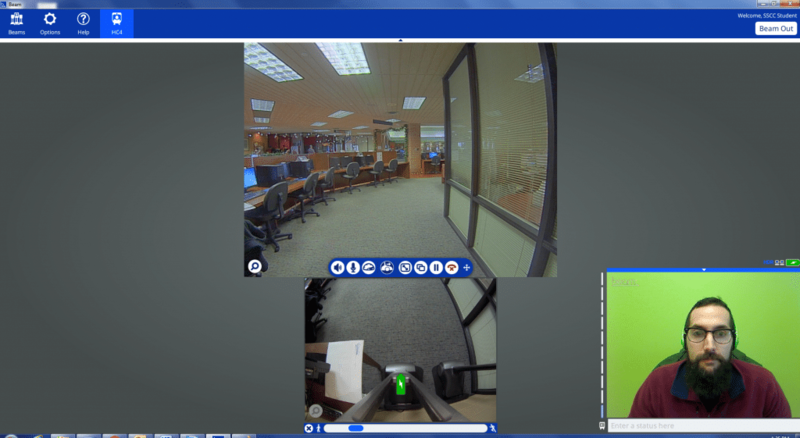 Specifically, it’s a Beam Telepresence robot—what amounts to a motorized, remotely controlled computer monitor that allows students, instructors or other faculty members to virtually attend or teach classes, participate in meetings, or take a tour at two of the four Southern State campuses. The four-foot-tall rolling robots were described to Toggle as “user-friendly” by Brian Rice, the school’s chief information officer. Just to be sure, I took one for a test drive. With just a couple of clicks and some finger tapping, the software is installed on my office computer, I am logged in and being prompted to watch a brief instructional and safety video. The video cautions against taking the robot near stairs and asks users to avoid running into furniture or pedestrians. Fair enough. This particular Beam model—nicknamed “HC-4” by Southern State—runs about $2,000 on Amazon. 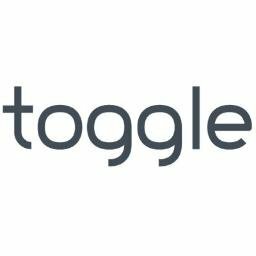 Matt Sulem, writer for Toggle, drives a robot in Ohio from Maine. 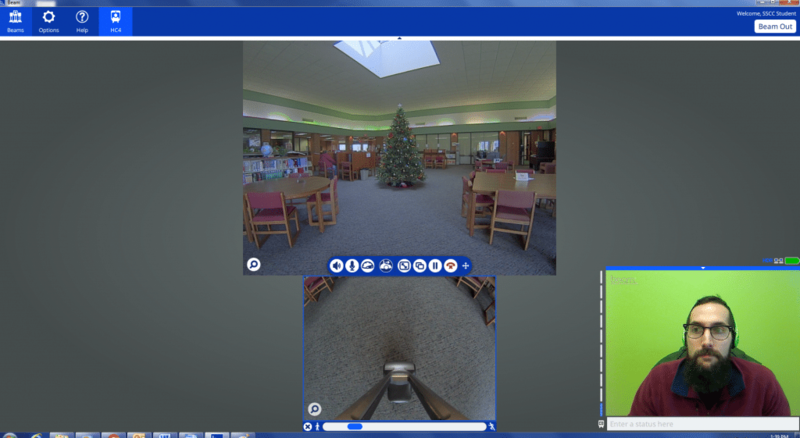 The primer’s brief, and soon I am overwhelmed by three different views displayed on my monitor: a forward-facing view of the campus library, a view of the ground immediately in front of the wheels (like looking at my feet) and a small screen showing the user (me), displayed to everyone who sees the robot on the LCD screen, as would happen during a Skype conversation. Sitting in front of a bright green office wall, I look like a bewildered, rookie weatherman whose green-screen graphics just failed with the whole nation watching. My audience, however, is limited to the three people milling about the library. Not wanting to seem completely inept, my fingers quickly find the keyboard’s directional keys (alternatively, I could click the cursor on the ground view just ahead of HC-4, or use the touchscreen of a smartphone or iPad, if my employer had opted for that technology) and my maiden voyage begins. Almost immediately, someone pops into my screen from the right side like an attacker in a classic, first person shooter arcade game. If she were a zombie, I’d be a goner. False alarm. 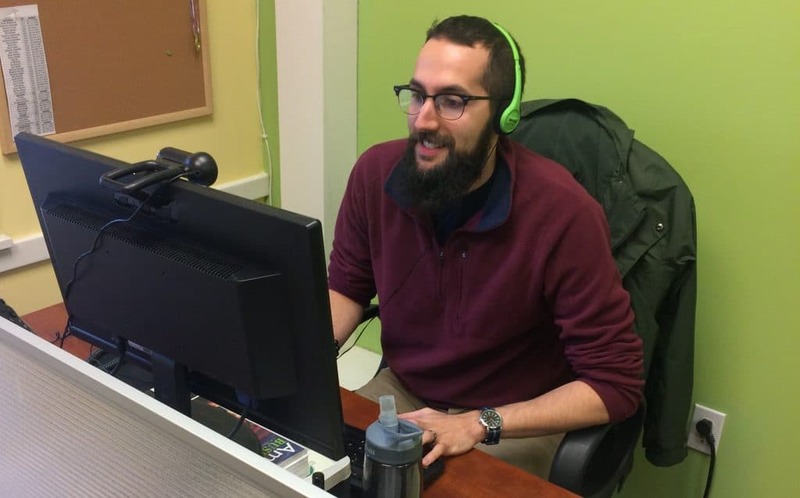 It’s just a friendly librarian asking if I need assistance, sounding as if she is actually standing in front of me—even though Toggle’s Portland, Maine, office is nearly 1,000 miles from Southern State. “Yes!” I thought to myself. Instead, I play it cool and give her the affirmative: A-OK. I’ve been a droid for all of 30 seconds, and I’m not about to start panicking like I’m C-3PO entering Jabba’s Palace for the first time. Plus, I’m already starting to get a handle on the controls, and soon I’m cruising around the library and into Southern State’s main lobby. Matt explores the Southern State Community College library. Well, not exactly cruising. Although there are multiple speed settings, HC-4 can only move at a few miles per hour, and I was cautious while rumbling along the brick floors of the lobby. I’m not sure if anyone has damaged a robot yet, but I wasn’t about to be the first. And … I’m stuck, wheels spinning in futility. A renegade brick jams one of the wheels. As if from above, a helpful hand appears in the ground view camera to give me a nudge, and a reassuring voice assures me that everything will be okay. I feel like an overturned turtle that has been righted. Thank you, kind stranger. I soldier on, exploring every major hallway in the Central Campus’ main building. Just before heading back to the library, I hit a second snag, as the connection is dropped. As my knowledge of fixing lost connections is limited to hitting the “refresh” button over and over again, I am, once again, defeated. Worst of all, I can no longer see any of the three screens. Is a crowd of curiously onlookers assembling around this stranded android in concern? Is my face, plastered with a look of bewilderment, frozen embarrassingly on the screen for all to see? I fire off a quick email to Tyler Bick, webmaster and soon-to-be robot savior, explaining my situation and precise location. Within a minute, I am connected again, and Tyler, laptop in hand, can be seen peering into the main camera like an attending physician. I had emerged from the world’s shortest coma. Matt perusing the computer lab. As far as the single-level main building is concerned, there really isn’t anywhere the robot can’t go—except through closed doors, which the ever-helpful Bick assisted with during an impromptu tour of my surroundings. As Toggle learned in a previous story from CIO Brian Rice, he and Bick spent a month or so driving the bots around campus to test the terrain and wireless signals. It shows. The audio and visual functions of the robot are nearly seamless, and keeping up with Bick is a breeze. The mounted microphone has no problem picking up greetings from the occasional passerby—including one guy who actually used the word “greetings” while slowly waving directly in front of the camera, as if he were introducing himself to an alien being. The mics were sensitive enough to hear the whispers in the background that the bot was “so cool,” “really weird,” “kind of creepy” or other things onlookers thought I couldn’t hear. To be honest, at first I fell into the opinion that “this is creepy.” Viewing real people from afar has an odd, almost voyeuristic vibe that takes a few minutes to adjust to. However, HC-4 was warmly received by almost everyone I encountered—even a group of prospective Southern State students on a tour, although a few of them could be seen in a state of awe or disbelief, mouths agape, as they say. For many of the current students, seeing the Beam robots drive by is not rare, and some had no reaction whatsoever, unless I chose to engage them first with a hello. Even folks who have never seen the bots in person might be familiar with them from TV, film or the internet. On CBS’ “The Big Bang Theory,” Sheldon Cooper (Jim Parsons) occasionally uses a similar invention, which he calls a “Mobile Virtual Presence Device,” and dresses it up in a t-shirt. Southern State once similarly clothed one of its robots in a college t-shirt, just for fun, Rice says. On FOX’s animated sitcom “Bob’s Burgers,” Tina Belcher was allowed to borrow one when she broke her ankle and couldn’t attend class. The last example is not far off from reality, as students who are ill, injured or disabled have used Southern State’s Beam bots for this exact purpose. Me? I’m just a poser messing around with the technology like it was a video game, where the objective is not embarrassing myself. After an hour of exploring, HC-4’s battery level—which is clearly indicated on the computer screen—was only halfway depleted, but it was time to head home. In what might be the most fascinating aspect from a geeky standpoint, the robot’s camera can spot the docking station when it gets within about 10 feet, and the dock even lights up on the user’s screen to indicate its presence. By pressing and holding “P” on the user’s keyboard, HC-4 will approach the dock, turn itself around, and perfectly park, ready to charge. It was like one of those self-parking cars, except I didn’t have to worry about denting someone’s Mercedes. After logging out and contemplating the extremely enjoyable experience, it felt like I had visited the campus of Southern State Community College, as I saw most of the main building, greeted students and faculty, and even ran into Brian Rice—but not physically, of course. That would be against the rules—both the guidelines set by Rice and the laws of robots written by Isaac Asimov—and is no way for a robot to treat its master.